Children differ in how they respond to parental incarceration. Factors such as positive relationships with other caregivers can protect children from negative outcomes (Parke & Clarke-Stewart, 2001). For example, a high-quality relationship with the imprisoned parent prior to the incarceration has been proposed as an important protective factor. The quality of a child’s relationships with the remaining parent, extended family, and nonfamily adults also appears to predict better adjustment. 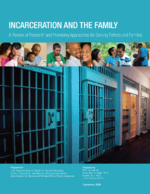 Researchers have begun to suggest that the quality and frequency of contact with the incarcerated parent (if positive) can moderate negative child outcomes (Johnson, 2006; Arditti, 2005; Parke & Clarke-Stewart, 2001). These findings highlight protective factors which may be bolstered to support child-well being during parental imprisonment.